In this project, where the main focus is chronic heart failure, the advantage of continuous monitoring is to follow the action of the heart throughout the day and the night. Thus, one can see how the heart reacts to different kinds of stresses, to different kinds of activities and to different sorts of medications. A continuous monitoring of a patient can also give the physicians the possibility to make a direct comparison of the actual patient condition with a past condition (one day, one week or one month earlier). Therefore continuous monitoring is a major leap forward in the diagnosis and the treatment of cardiac congestive heart failure (CHF). Prerequisite for this are very reliable monitoring instruments that detect the most relevant variables for the diagnosis and also for the treatment to be followed. Current monitoring of CHF consists in periodical assessments of cardiac parameters such as blood pressure, EKG, echocardiography and some blood markers. Carrying out these monitoring procedures is time consuming and requires a well-trained cardiologist for the echo-cardiographic analysis. Furthermore, it is expensive to do, in terms of both the personnel costs and blood tests. Current monitoring only reveals a snapshot of the cardiac condition. As monitoring is periodical and not continuous, patients may suffer from major changes in their condition that remain undetected in the interval between measurements. ULTRAsponder intends to overcome these limitations by proposing a simple yet effective solution based on continuous monitoring and data collection on an external control unit. Data can be transmitted over the cellular phone network or Internet during day or night to provide the treating physician with all relevant data timely and cost effectively with minimal discomfort for the patient. Despite the technological advancements made in the past years, the design issues for deeply implanted devices remain numerous, especially concerning miniaturisation and power consumption. A continuous or pulsed wave is transmitted from a control unit towards a transponder. The transponder reflects the wave back by changing its load impedance. The received echo at the control unit is demodulated. This technique is widely used in RFID tags. Radio frequency identification technology (RFID), first invented by Harry Stockman who published in 1948 the report "Communication by Means of Reflected Power," has become more and more popular in the last few years. The key feature of the technology is the ability for an RFID-tagged object to be tracked, provided that a reader, also called interrogator, is in range. Furthermore, RFID tags can contain sensors that transmit valuable data to the receiver, which is included in the interrogator. However, because of the body's dielectric nature, communicating with implants that are located deeply within the body, using conventional techniques like Radio Frequency (RF), may not work effectively (see the table). Another important concern is the electromagnetic compatibility, which is associated to communication based on radio frequency. It is becoming more and more difficult to ensure a radio communication characterised by a high immunity to external sources. The ever-increasing number of wireless hotspots associated with the use of wide frequency spectrum in modern radio devices, render the use of electromagnetic waves as a questionable transmission medium as shown in the table below. New roads need to be opened to overcome the limitations of RF techniques and to ensure the viability of emerging deeply implanted medical devices. One of the main innovations of this project is to apply the backscattering communication principle to acoustic waves. The electrical signal delivered by the transmitter of the interrogator is transformed in an acoustic wave thanks to a piezoelectric transducer contained in the external interrogator, namely the control unit. The acoustic wave sent by the control unit is not modulated during this stage of the operation. Then, this acoustic wave propagates in the direction of the implanted sensor, namely the transponder. The proposed innovation is to apply the same backscattering principle as for RFID to acoustic coupling to send back information from the transponder to the control unit. Another piezoelectric transducer is integrated to the transponder. The transducer receives the acoustic wave coming from the control unit. The output of this transducer is connected to an impedance switcher. Thanks to this impedance switcher, the input acoustic impedance of the transponder, and therefore the reflection coefficient of the implanted transponder, is modified according to the data stream. The control unit receives the acoustic modulated backscattered signal and retrieves the data. ULTRAsponder is aimed at developing systems and methods, not using RF or electromagnetic telemetry with their limitations, but acoustic waves (ultrasounds), for communicating with, and charging efficiently a network of transponders that are placed deep inside a human body. Such systems are small and light, allowing them to be placed either via open surgery or minimally invasive techniques. A transponder may include one or more sensors for monitoring a variety of parameters, such as temperature, pressure, strain or fluid flow and chemical, electrical or magnetic properties. It may also perform therapeutic functions such as drug delivery, defibrillation or electrical stimulation. 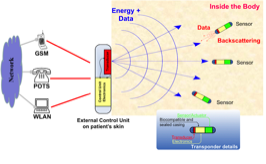 As part of a network, several transponders can com-municate and exchange information to the external control unit, leading to address complex biological and clinical applications. This project is also dedicated to external systems for controlling, charging and communicating with such a transponder network, and to methods using such systems. In addition, the external control unit acts as a gateway for the entire system. To assess the overall system in a real environment for a particular application aimed at measuring physiological parameters and correlating them (data fusion) to perform advanced diagnostics.